id Software Creative Director Tim Willits is a big fan of the "always on" DRM in Diablo 3 and believes Blizzard has the muscle to force gamers to love it. The debate over the relative merits of Blizzard's decision to require an always-on internet connection in order to play Diablo 3 has been raging since the moment it came to light and will probably continue for months after the game's release. Supporters say it gives Blizzard more flexibility in how it approaches the game and that virtually all players will be online when they play anyway; those who are less-than-thrilled with the idea point out that despite the widely-held belief in internet ubiquity, not everyone has access to reliable, full-time connections and that making it a requirement for solo play is unreasonable and unfair. One well-placed observer who's come out strongly on the pro-Blizzard side is Tim Willits, the creative director at id Software, a studio famed for its groundbreaking work in online gaming. He likes the idea, and he thinks that it could go a long way toward shaping the future of the game industry. 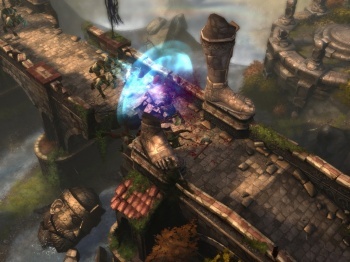 "Diablo 3 will make everyone else accept the fact you have to be connected," he told Eurogamer at last week's QuakeCon. "If you have a juggernaut, you can make change. I'm all for that. If we could force people to always be connected when you play the game, and then have that be acceptable, awesome." Willits described himself as "a big proponent of always connected," saying that he and id Software fans in general are always online. "In the end, it's better for everybody. Imagine picking up a game and it's automatically updated. Or there's something new you didn't know about, and you didn't have to click away. It's all automatically there," he said. "But it does take juggernauts like [Diablo 3] to make change." "There will be a few people who will resent the fact you have to be online to play a single-player game," he added. "But it'll change." In theory, I like the idea of a world in which everyone is connected to each other and the developers, who can use that persistence to build a community and a better game. But from a practical perspective, I have serious reservations about making a game's accessibility dependent entirely upon the condition of external servers [see Ubisoft for more on that] and excluding a potentially large number of gamers based solely upon where they live. But it's also hard to argue that Willits isn't right. If Blizzard can make people stop worrying and learn to love the bomb - and if any company can pull that off, it's Blizzard - then you can be sure there will be plenty of other studios and publishers following closely behind. Like it or lump it, this is the future.